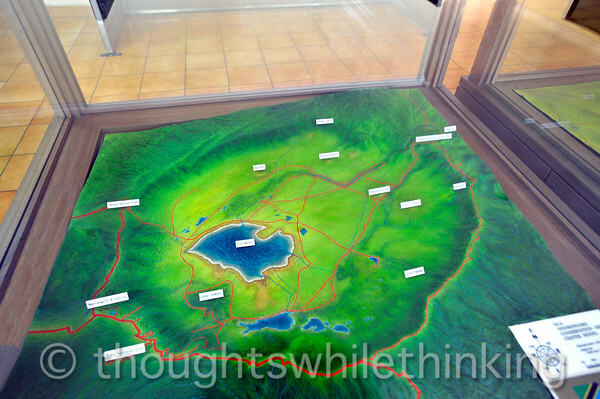 At last at the Ladoare Ngorongoro Park Gate, the info center offers this 3-D map of the crater and other thoughtfully presented large photo panels describing wildlife in the crater and surrounding highlands. A pleasant way to pass the time while our driverguide is dealing with the official paperwork and the baboons are pinching our stuff from our vehicle. This is where the asphalt ends and the dirt roads begin. Entering the crater rim from the lower right, we traveled counter-clockwise along the rim to a crater observation post and then on to camp just inside Lemalala Gate and ranger post on the Northern Descent Road. It is near the longish white strip on the NE/upper right rim.